Great Italian food is all about great ingredients which are cooked simply. 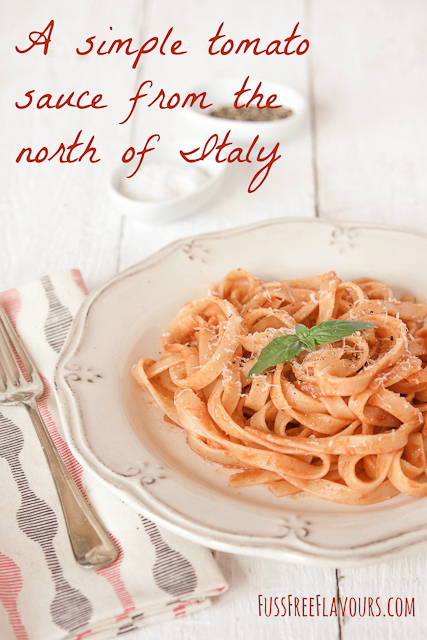 This easy to make tomato sauce is inspired by travels to Italy and will become a go to recipe. As a relatively young country, Italy still has strong regional identities and this is reflected in her great variety of cuisines. While the common thread across Italy is the ethos of taking the best ingredients and simply cooking them to show them at their finest, the favoured ingredients, and preferred methods of preparation, vary significantly according to where you are. One prime example of the variations in Italian cuisine are the differing uses of tomatoes across the country. Tomatoes grow well all across Italy, but their use varies from region to region. For example the Veneto region cooks with a smooth passatas which are suitable for both a delicate quickly cooked fish, or a longer slower cooked dishes such as those containing meatballs and rice. Parma is in the Emilia Romagna region; the capital Bologna is the home of ragù alla bolognese, again made with tomatoes but this time a concentrated puree. The rolling hills of Tuscany surround Florence, and here you will find fresh chopped tomatoes served simply on Bruschetta, or tomato and bread soup, washed down with a glass of Chianti, from central Tuscany. If you love this and want a variation try adding some roasted red peppers, like in this recipe for tomato with roasted red pepper sauce from Tinned Tomatoes. Or serve over pasta and meatless balls. Or with my beans and tomato sauce. If you try this A Simple Tomato Sauce from the North of Italy please tag #FussFreeFlavours on Instagram or Twitter. It is amazing for me when for me when you make one of my recipes and I really do love to see them. You can also share it on my Facebook page. Please pin this recipe to Pinterest too! Thanks for reading Fuss Free Flavours! Gently sauté the onion and garlic in the olive oil until it starts to turn golden, reduce the heat and add the passata. Fill the bottle about a third full with water give a good shake and add to the pan. Season with salt and pepper. Gently cook for about 20 minutes stirring from time to time (I use a splatter guard to cover the pan otherwise it can make a mess on the hob) until reduced by about a third. Toss with freshly cooked pasta and serve with a few fresh basil leaves and a sprinkling of parmesan. A great quality passata will already be sweetly and fully flavoured, so needs little cooking to make a fantastic sauce. You need just enough to lightly coat the pasta, rather than having a pool of sauce for the pasta to swim in. Left over sauce will freeze well.